← My church is starting a community garden! 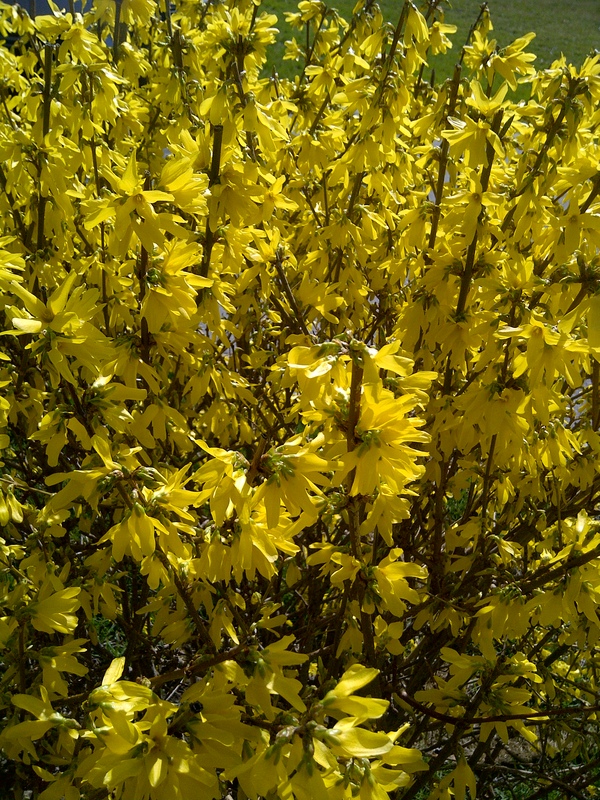 The recent warm spell has coaxed local forsythia bushes into blooming, even though it is only March. I have always loved their bright, cheery arrival while the grass is still brown and the weather is still cool, especially when there are nearby daffodils or blue scilla. Our backyard has two large Northern Gold forsythias, one in each back corner, and although it was not the best design (it was a nostalgic choice that I wrote about last spring) I still happily welcome their spring burst of yellow blooms. As I was coming home from the grocery store, I made sure to drive by my favourite forsythia spot. 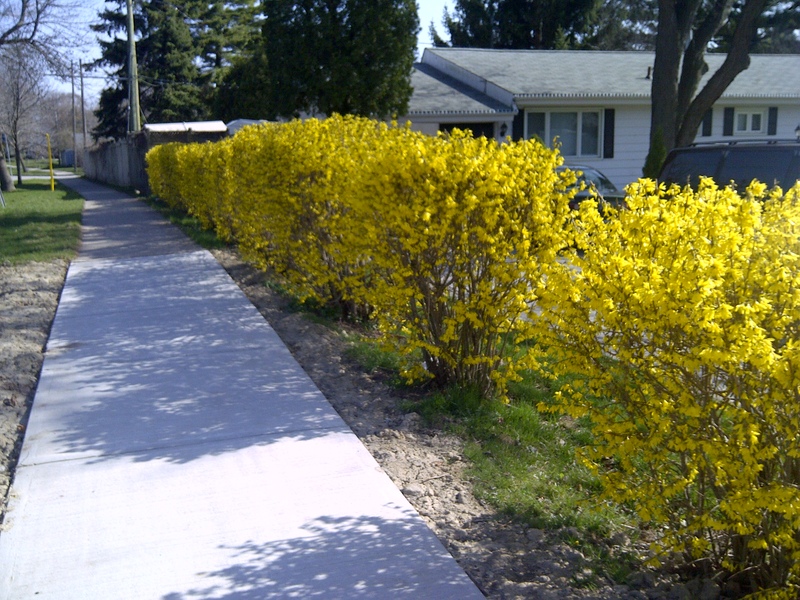 It is a corner lot where some clever gardener has planted an entire hedge of forsythia, a dozen or so bushes that stand shoulder-high along the sidewalk. Even though I have seen them before, their beauty was so breathtaking that that I made a U-turn and pulled over to have a longer look. Spectacular! Alas, it will not be long before a fine green haze will cover those branches, and the little yellow blooms will drop off one by one. Today’s glory will fade away until all that is left is a plain, green shrub. Then nobody–including me–will notice them anymore. There is a conversation I have often had with my children. “How many people are in our family?” I would ask one of them. “Six” they would reply, sighing because they knew what their mother would say next. “That,” I would declare, “means it can’t always be your turn”. It is an important lesson that I am teaching my children. Sometimes they will be at the front of the line, the star of the show, the one to get the big, red lollypop. Other times they will be part of the background, the supporting cast, the unseen wind beneath someone else’s wings. This is as it should be. Like the forsythia that blooms gloriously for one season a year, each of us has seasons in our lives when we bask in the spotlight. We also have seasons when we need to be content with helping others enjoy their own shining moment. Parents who work to ensure that their child is always the centre of attention do them a grave disservice. (I know one mother whose child went to every birthday party with a gift for himself. She didn’t want him to feel badly, she said, when the birthday girl or boy opened their presents!) Not only will they be ill-equipped for adult life, but they miss out on the warm feeling of satisfaction that comes from helping others achieve great things. 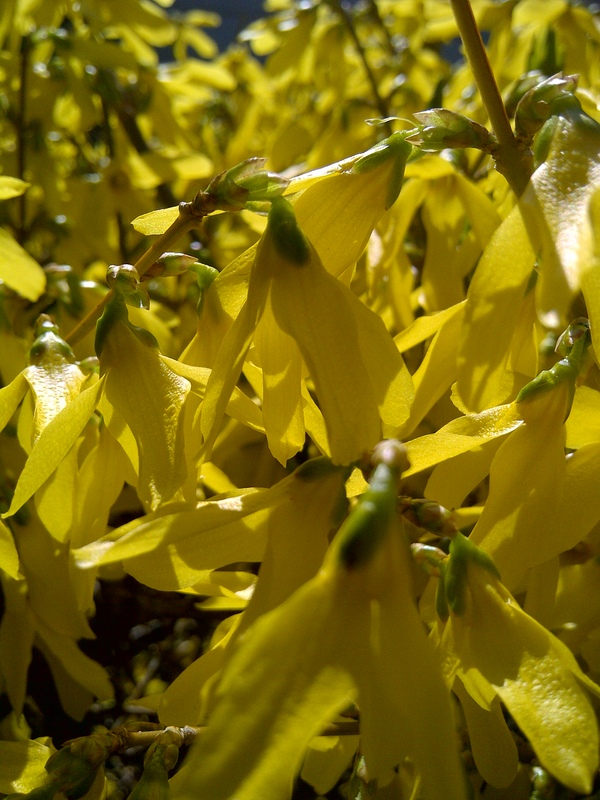 I don’t feel sorry for those yellow forsythia bushes because their beauty will one day fade. Although they may be a plain piece of the landscape for much of the year, right now it is their time to shine and as long as it lasts, I am going to enjoy it. Then it will be time to ooh and aah over the magnolias and lilacs, the roses and peony. Don’t worry, my forsythia friend. Your turn will come around again next year. This entry was posted in Uncategorized and tagged family, flowers, kids, life, neighbourhood, seasons. Bookmark the permalink.